Objective: This study aimed to evaluate the etiology, clinical profile, morbidity, diagnosis, and management of vertigo among elderly patients at a tertiary care teaching hospital of Eastern India. Materials and Methods: Seventy-two elderly patients were diagnosed as cases of peripheral vertigo above the age of 60 years enrolled in this study. The detailed etiology, clinical presentations, diagnostic methods, and treatment were assessed. Results: The most common peripheral vestibular disorders were benign peripheral paroxysmal positional vertigo (38.38%), idiopathic vestibulopathy (9.72%), migraine-related vertigo/migraine vestibulopathy (26.38%), Meniere's disease (5.55%), and acute vestibular neuritis (6.94%). Diabetes mellitus is a common systemic disorder associated with elderly vertigo patient. Mental disorders such as anxiety (18.05%), depression (15.27%), and phobia (12.5%) were seen in this study among elderly vertigo patients. Conclusion: This retrospective study revealed that 72 of elderly patients had been diagnosed with peripheral vertigo. The majority of vertigo patients are of benign paroxysmal positional vertigo with unilateral horizontal canal involvement among elderly patients in this study, followed by migrainous vestibulopathy, idiopathic vestibulopathy, and vestibular neuritis. Proper diagnosis and management help to make a better and quality life in elderly patients suffering with vertigo. Balance of the body is always essential in all activities of daily living. Balance is a dynamic process and its maintenance requires the vestibular system, the visual system, the proprioceptive system, and the central nervous system. Impairment of any of the component leads to imbalance or vertigo. Vertigo is one of the important clinical symptoms which have a negative influence on the well-being among the elderly population. Dizziness or vertigo is a common symptom among elderly people. There is a rise of elderly persons visiting the vertigo clinic with complaint of dizziness. This may be due to a gradual diminishing of the vestibular function in elderly population and increase in life expectancy. Balance of the elderly person depends on the several factors including vestibular, visual, somatosensory structures, joint mobility, cognition, and adequate sensory function. The sensory structures are often impaired by certain diseases of the aging such as metabolic, cardiovascular, psychological, central nervous system disorders, diabetic neuropathy/retinopathy, cataracts, macular degeneration, and senility of central and peripheral vestibular system. Certain factors such as sedentary lifestyle, self-medication, and polypharmacy are aggregative to the balance of the body in elderly persons. The vertiginous disorders are often difficult to diagnose in older population, who frequently associated with comorbidities and potential causes for physical notability. Vertigo in elderly person may lead to falls in elderly and often associated with high rate of morbidity and mortality. Although vertigo in old age represents a life-threatening conditions, most often are benign and self-limited diseases. Although vertigo is a common clinical problem among elderly age, there are few studies available in medical literature for vertigo in elderly age. The aim of this study is to evaluate the etiology, clinical presentations, diagnosis, and treatment of vertigo among the elderly population at a tertiary care teaching hospital of Eastern India. A total of 72 patients who attended vertigo clinic of the otorhinolaryngology department between January 2016 and April 2018 were included in this study. Inclusion criteria were both male and female patients above the age of 60 years with a chief complaint of dizziness for at least 3 months. Detailed diagnoses of vertigo with vestibular origin were confirmed by clinical assessment done by otolaryngologist with evaluation history, physical examination, and vestibular examination. Exclusion criteria were patients those were suffering from otitis externa, acute otitis media, chronic suppurative otitis media, past history of ear surgery, and preexisting neurological diseases such as cerebral ischemic diseases and neurodegenerative diseases. Detail history taking was done of each patient for vertigo symptom, aggravating factors, relieving factors, history of hypertension, cardiac disorders, diabetes mellitus, neurological disorders, thyroid disorders, whiplash injury, drug history, addiction, and progress of vertigo symptom. Detail neurootological examinations were done in each patient including ear examination, cranial nerve examination, finger–nose test, Romberg's test, Unterberger stepping test, head-impulse test, Dix–Hallpike test done for posterior and anterior canal benign paroxysmal positional vertigo (BPPV), and supine roll test for horizontal semicircular canal BPPV. Electronystagmography (ENG) test was done in each patient after cessation of labyrinthine sedatives for 48 h. All vertigo patients were evaluated for psychological disorders by the psychiatry department. Out of the 72 patients of this retrospective study, 42 (58.33%) patients were male and 30 (41.66%) were female with the mean age of 68.20 years. BPPV was seen in 28 (38.38%) cases out of 72 [Table 1]. All of these 48 patients underwent Epley's maneuver. Out of 28 patients, 22 patients were benefited by the Epley's maneuver. Out of 28 patients of BPPV patients, 21 were unilateral and 7 were bilateral diseases. Out of 28 BPPV patients, 22 (78.57%) had horizontal canal involvement and 7 had multiple canal diseases (8.33%) [Table 2]. Other etiologies of vertigo in this study were migrainous vertigo (26.38%), idiopathic vestibulopathy (9.72%), and Meniere's disease (5.55%) [Table 1]. 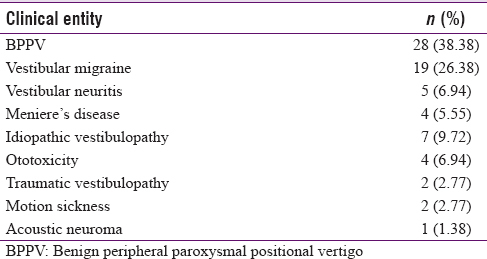 Systemic disorders associated with vertigo with vascular lesions including hypothyroidism, vertebrobasilar insufficiency, and atheromatous diseases [Table 3]. Posttraumatic vertigo was seen in 4 patients, following blunt injury to the temporal region of the head. Ototoxicity was seen in 4 (6.94%) patients due to the use of aminoglycoside. One (1.38%) patient was diagnosed as acoustic neuroma and 2 (2.77%) presented with motion sickness. Due to vertigo, elderly person may develop mental disorders in day-to-day life. In this study, anxiety (18.05%), depression (15.27%), and phobia (12.5%) were common clinical findings that were seen among elderly person those suffering from vertigo [Table 4]. The term vertigo or dizziness defines a variety of symptoms due to disorders of spatial orientation and motion perception such as illusion of rotatory motion or feeling of unsteadiness which hamper to achieve a stable posture, gaze, and gait. Aging of a person leads to progressive degeneration of the vestibular system along with neuromuscular, musculoskeletal, and sensory systems of the body. The term presbyastasis is often used to describe the age-related disequilibrium. Vertigo or dizziness is an important clinical symptom seen in the clinical practice and often seen in the older population. Vertigo is often contributed by several factors such as aging, old age associated with taking chronic use of drugs, and sometimes polypharmacy. Vestibular function, proprioception, and vision along with central connection to the brain play a vital role for maintaining balance. There are two factors responsible for vertigo in the elderly population which is a major health-care problem. The first factor is rise of elderly population in the present day due to improved health-care facilities in the country. The second factor is rising of the balance problems as increasing of the age. The elderly persons have often difficulty of sensory function, central nervous functions, and skeletal and neuromuscular functions. The chronic diseases in elderly persons such as atherosclerosis may cause damage to the labyrinthine functions and lead to peripheral vascular occlusion. Diabetes mellitus often accelerates atherosclerosis and leads to peripheral neuropathy. The mean age of this study population is 68.20 years. In this study, BPPV is more prevalent among male with male to female ratio is 1.4/1. The history of the patient such as symptoms of vertigo, medical history, medications, and alcohol intake if any should be documented. Detail examinations such as head and neck examinations, otoscopy, Dix–Hallpike test, visual acuity, and physical examinations such as pulse, blood pressure, and tests for orthostatic hypotension are essential for getting the diagnosis. Neurological examinations such as examination of the lower limb, tendon reflexes, and tandem gait are helpful to rule out the central causes of vertigo. Few investigations such as random blood glucose, hemoglobin estimation, electrocardiography, pure-tone audiometry, and psychological questionnaire are helpful for management of vertigo in elderly population. A good history taking is vital for assessing a patient with vertigo and helpful for diagnosis in around 70% of the patients. It is often challenging for knowing the exact meaning of dizziness complained by the patient. The precise sensations of the patient regarding the dizziness are often helpful for better diagnosis. Vertigo refers to illusion of the movement and feels the movement of surrounding objects. The presyncope means feeling of light-headedness, whereas disequilibrium refers to unsteadiness. The elderly population is often affected by vertigo which affects their mobility and leads to fall and other morbidities. Vertigo may be intense and sometimes accompanied by auditory and neurovegetative symptoms. Many times, patients present with intense emotional distress and show anxiety and depression. Patients of elderly vertigo often visit neurophysicians and are subjected to different investigations such as computed tomography scan and magnetic resonance imaging to rule out the central cause of vertigo. Many times, simple tests such as Dix–Hallpike test, head-impulse test, and supine roll test are enough to give a clue for diagnosis. The investigations such as ENG, electrocochleography, and other tests may be used for diagnosis. Simple tests for diagnosis and specific treatment help the elderly population comfortable and avoid unnecessary medication on vertigo management. The successful treatment of elderly vertigo patients aims at reducing the disequilibrium and minimizes the risk of fall. The treatments of vertigo among elderly persons include treatment of specific condition such as BPPV, pharmacological treatment of vertigo, and nausea with vomiting. Patients need counseling and reassurance. Patients often need specific vestibular rehabilitation and prophylaxis for vertigo. BPPV is the most common clinical entity for causing vertigo in this study. It is one of the most treatable causes of vertigo. Elderly patients with vertigo have high chance of mental disorders such as anxiety, depression, and phobias. The psychological symptoms limit social activities of the patients and affect their quality of life. Patients presented with psychological symptoms are more prone for disabled in the form of mental and physical disability. PP particle repositioning exercises such as Epley maneuver are the mainstay of treatment for BPPV. In a meta-analysis, 74% of the patients of BPPV who had undergone the Epley's maneuver got the clinical resolution of the symptoms. Brandt–Daroff exercises may be performed at home for BPPV and useful for recurrent attack, although the treatment outcome is less than the Epley maneuver. However, the treatment of BPPV is sometimes difficult in the elderly for several causes. Patients with restricted neck mobility may have problems during head rotation in Epley's maneuver. In this situation, examination couch may be used where the head position is lowered 30° so that the head and trunk are reclined during maneuver and further reclination of the head is not needed. There is another alternative maneuver called Semont's maneuver which does not need any kind of head reclination. In a case of obese or frail patient, it is difficult for rapid body swing in case of Semont's maneuver. The cognitive problems and fear for falling or dizzy interfere with performing self-treatment at home. Medications in vertigo of elderly person are often useful in case of acute phase of vertigo such as Meniere's disease, labyrinthitis, and acute vestibular neuronitis. In vestibular neuronitis, the symptomatic treatment with drugs like antiemetics and vestibular sedatives such as prochlorperazine or cyclizine is often helpful in the first few days of the acute attack. The duration of the treatment in vestibular neuronitis should not be done for more than a few days as they delay the central compensation mechanism and long-term recovery. Pharmacological treatment of acute vertigo is useful for the symptomatic relief of vertigo in elderly persons. A long-term anti-vertigo medication in old age is avoided as it obstructs vestibular compensation, again increases the chance of falls. Vestibular rehabilitation includes a series of exercises such as adaption exercises, habituation exercises, substitution exercises, balance exercises, gait exercises, and general condition exercises. The adaption exercises aim to improve the vestibulo–ocular reflex and include head movement with focus on a fixed target point. Habituation exercises aim to extinguish pathologic positionally provoked responses, whereas substitution exercises aim to learn alternative strategies to compensate for the deficities. Certain devices are designed to reduce fall and improve the overall mobility of the elderly people. Devices such as walkers and canes widen the base of support and increase the somatosensory feedback. The footwear can be redesigned for enhancing the stability and balance of the body. Surgery for vertigo is suggested when conservative treatment does not give adequate relief or in case of surgically correctable pathology of the peripheral vestibular system. The surgical procedures are labyrinthectomy, vestibular nerve section, posterior semicircular canal occlusion, and endolymphatic sac decompression. Sometimes, the etiology for vertigo in the elderly patients is not found and is attributed as presbyastasis treated with vestibular rehabilitation therapy. Vertigo is a common complaint observed in elderly individuals. Clinical history and detailed neuro-otological examinations are essential for assessing vertigo among elderly population. The etiology of vertigo among elderly is more likely to be vestibular or peripheral in origin. Dix–Hallpike test should be done in all cases of vertigo among elderly persons. If Dix–Hallpike test is positive, Epley's maneuver should be done. ENG is often done in vertigo protocol during managing vertigo among elderly population. Reduced vestibular function due to aging is a very common cause for vertigo or imbalance in elderly population. Vestibular rehabilitation exercises have great role for treating vertigo in elderly people. This study has a relatively small sample size and may limit the outcome of the above interpretation. However, the outcome of this study will definitely encourage the further research in vertigo among elderly people. Jönsson R, Sixt E, Landahl S, Rosenhall U. Prevalence of dizziness and vertigo in an urban elderly population. J Vestib Res 2004;14:47-52. Lee H, Yi HA, Lee SR, Ahn BH, Park BR. Drop attacks in elderly patients secondary to otologic causes with Meniere's syndrome or non-Meniere peripheral vestibulopathy. J Neurol Sci 2005;232:71-6. Baloh RW. Vertigo in older people. Curr Treat Options Neurol 2000;2:81-9. Fernández L, Breinbauer HA, Delano PH. Vertigo and dizziness in the elderly. Front Neurol 2015;6:144.
de Moraes SA, Soares WJ, Rodrigues RA, Fett WC, Ferriolli E, Perracini MR. Dizziness in community-dwelling older adults: A population-based study. Braz J Otorhinolaryngol 2011;77:691-9. Salvinelli F, Trivelli M, Casale M, Firrisi L, Di Peco V, D'Ascanio L, et al. Treatment of benign positional vertigo in the elderly: A randomized trial. Laryngoscope 2004;114:827-31. Maarsingh OR, Dros J, van Weert HC, Schellevis FG, Bindels PJ, van der Horst HE, et al. Development of a diagnostic protocol for dizziness in elderly patients in general practice: A Delphi procedure. BMC Fam Pract 2009;10:12. Tinetti ME, Williams CS, Gill TM. Dizziness among older adults: A possible geriatric syndrome. Ann Intern Med 2000;132:337-44. Byers AL, Yaffe K, Covinsky KE, Friedman MB, Bruce ML. High occurrence of mood and anxiety disorders among older adults: The National Comorbidity Survey Replication. Arch Gen Psychiatry 2010;67:489-96. Imai T, Takeda N, Ikezono T, Shigeno K, Asai M, Watanabe Y, et al. Classification, diagnostic criteria and management of benign paroxysmal positional vertigo. Auris Nasus Larynx 2017;44:1-6. Gananca FF, Castro AS, Branco FC, Natour J. Interference with dizziness in the quality of life of patients with peripheral vestibular syndrome. Rev Bras Otorrinolaringol 2004;70:94-101. Staab JP. Chronic dizziness: The interface between psychiatry and neuro-otology. Curr Opin Neurol 2006;19:41-8. Maarsingh OR, Dros J, Schellevis FG, van Weert HC, Bindels PJ, Horst HE. Dizziness reported by elderly patients in family practice: Prevalence, incidence, and clinical characteristics. BMC Fam Pract 2010;11:2. Semont A, Freyss G, Vitte E. Curing the BPPV with a liberatory maneuver. Adv Otorhinolaryngol 1988;42:290-3. Walther LE, Rogowski M, Schaaf H, Hörmann K, Löhler J. Falls and dizziness in the elderly. Otolaryngol Pol 2010;64:354-7. Jung JY, Kim JS, Chung PS, Woo SH, Rhee CK. Effect of vestibular rehabilitation on dizziness in the elderly. Am J Otolaryngol 2009;30:295-9.